Google today announced the launch of its add-on store for Google Docs’ spreadsheet and word processor apps. The store, which resembles the Chrome Web Store in its design, currently features about 50 add-ons, with more coming in the near future. According to Google, the idea here is to provide users with new tools that will given them access to more features — especially features that aren’t currently available through Google’s own products. One of today’s launch partners is Avery Label Merge, which allows you to merge Google spreadsheet data into Avery address labels. Another tool that clearly extends Google Docs’ functionality is EasyBib’s Bibliography Creator, which now makes Google Docs a far better choice for students who have to spend their days wrangling with the MLA, APA and Chicago Manual of Style citation formats. 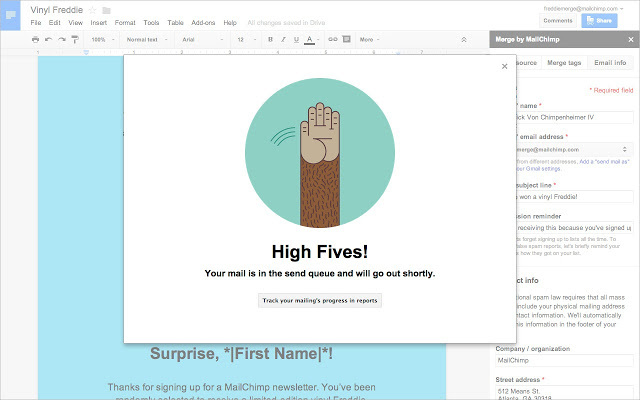 Other launch partners include Mailchimp, which lets you send customized emails from Google Docs, Letter Feed for tracking changes in documents, PandaDoc for electronic signatures and Uberconference, which is integrating its conference call tools into Docs. The add-on store is now available right in the regular menu bar of Google Docs. For now, it will only be visible in text documents and spreadsheets. Support for Google Slides, the presentation app, and Google Forms will come later. 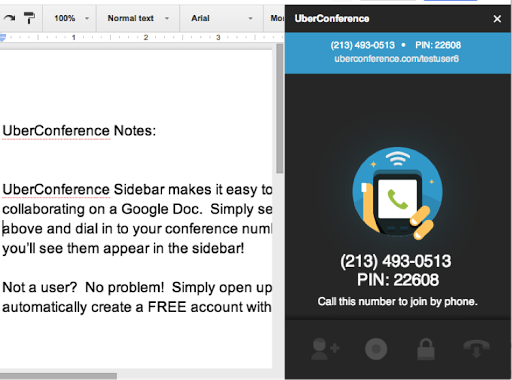 Here is what using the add-ons looks like for UberConference, for example. The add-on makes starting a conference call from any document a matter of a single click. Just like UberConference’s Hangouts app, the add-on will automatically create an account for users who don’t have one and initiate the conference right from the document. The call interface will then take over the right sidebar in Google Docs. Developers who weren’t invited by Google to be a part of this first batch will also be able to write applications for the store, but for the time being, they have to be approved by Google. The company says it will analyze every add-on’s use case and then whitelist accordingly. With the help of these add-ons, Google is clearly hoping to create a developer ecosystem around Docs. But maybe more importantly, these integrations will also make it more competitive in a landscape where Microsoft is now finally taking the online versions of its Office productivity suite seriously. For many desktop Office users, the ability to bring add-ons to the desktop versions of Word or Excel remains an important selling point. Avery also offers a similar tool for Word.